Earn $54.95 in Rewards credit. Click to learn more. Norco Bicycles’ 2018 Search Alloy Tiagra Gravel Bike is built for comfortable all-road, high mileage riding. 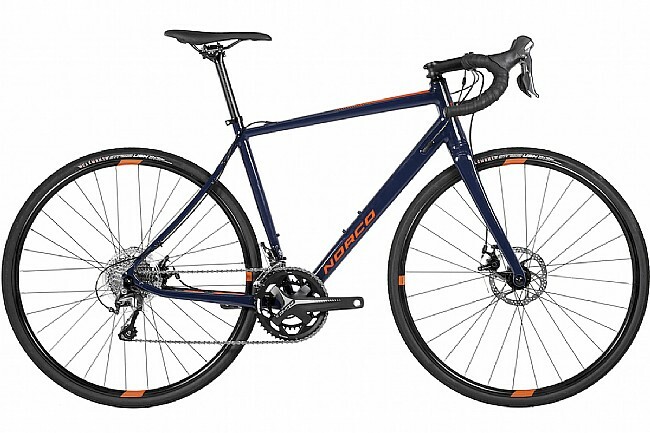 It features a Shimano Tiagra drivetrain, disc brakes, a vibration damping ARC Endurance design, and clearance for up to 35c tires. Frame Material: Search X6 Double Butted Aluminum. Front Derailleur: Shimano Tiagra FD-4700. Rear Derailleur: Shimano Tiagra RD-4700. Crankset: FSA Omega Adventure 48/32T. Bottom Bracket: FSA MegaExo BB-4000. Cassette: Shimano Tiagra CS-4700 11-32T 10 speed. Brakeset: TRP Spyre C Twin Piston Mech Disc - 160mm (front & rear). Hubs: Alloy 15x100mm thru axle 28h w/ Norco tooled TA skewer (front); Alloy cassette hub w/ bolted skewer (rear). Tires: Clement Strada USH 32c - Folding. Manufacturer Warranty: Norco offers a crash replacement program and a limited lifetime warranty for certain models including the “Search” model. Must register bike within 90 days of purchase.